The high-end look of wrought iron adds sophisticated elegance to any home. For windows, archways or wall installations, faux iron is a lightweight wrought iron alternative that is easy to customize, install and maintain. Without the high cost and installation hassles of wrought iron, you will enjoy its artistic, timeless look as a personalized addition to your interior decor or outdoor landscape elements. Faux iron offers many unique and customizable options as a spectacular addition to your home’s fine decor. Faux iron is an innovative composite material that is lightweight, eco-friendly and sustainable. 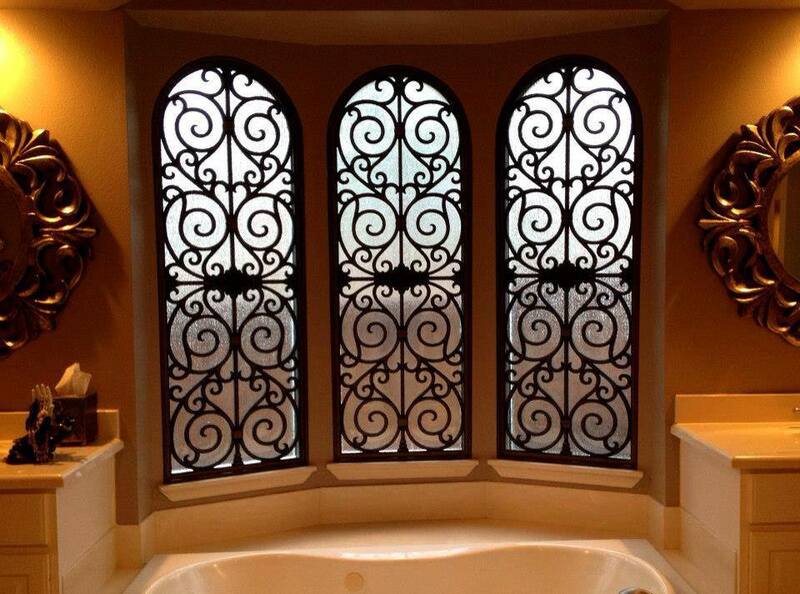 As a beautiful addition to your home decor, it adds the look of wrought iron to windows, shutter inserts, and nooks. Because it is easily customized to meet precise specifications, it is a superior choice for transoms, non-standard window shapes, arches, sidelights, and cornices. The unique, delicate filigree adds a decorative look without blocking light, and it gives your windows a high-end look to add traditional appeal to your home. Faux iron requires little maintenance beyond light cleaning, as it is a moisture, rot, and termite resistant product. The composite material will not rust or fade, and it will maintain its elegant look for many years. Faux iron is also appropriate for both indoor and outdoor applications. Choose faux iron as a permanently mounted addition to arches or nooks, or request hinges; simply swing the lightweight faux iron grille away from your windows for easy access to the glass surface for cleaning. As a decorative element that has traditional appeal, wrought iron is a standard element of Mediterranean design, and it is commonly seen for stair railings, windows, doorways, fences, gates, and balconies. As a non-structural element, faux iron is easily added to windows and archways to provide a decorative look. In the Spanish style or Victorian home, faux iron adds authentic details to the unique architecture. However, faux iron adds a beautiful look to any home, including contemporary decor and home design. A touch of the exotic Mediterranean region will give your home a custom look that enhances any type of architectural style. When you choose faux iron for your home, we will come to you for a free consultation. We will recommend products that will be ideal for your desired installation, take measurements for customization and provide you with a quote. If your home has arches, transoms and uniquely shaped windows – such as circular or eyebrow shapes – there are many ways in which faux iron adds a sense of style to your home. Installation is simple, and your faux iron grilles will look like they are an original part of your home’s architecture. Please note, we don’t begin production until you are completely satisfied with the CAD design. Customizable faux iron is available in many different color and pattern choices. We have many design options you can select, or, come up with something completely custom, like a family crest. Choose a traditional black, realistic metal or a patina that perfectly matches your home’s decor. If you have existing wrought iron elements in your home, we’ll work with you to find a faux iron style that will match or complement your existing decor. Because it is a maintenance free, durable product, expect your faux iron elements to provide many years of longevity without fading or losing their elegant look. As your window treatment specialist in the Austin area, Austin Blind Faith provides Tableaux Tracery products for all your faux iron decor needs. Please contact us today for more information about faux iron products, and schedule an appointment for your free in-home consultation with our professional representative.